VR Booking Fees - A Necessary Evil? Not So Fast!!
" 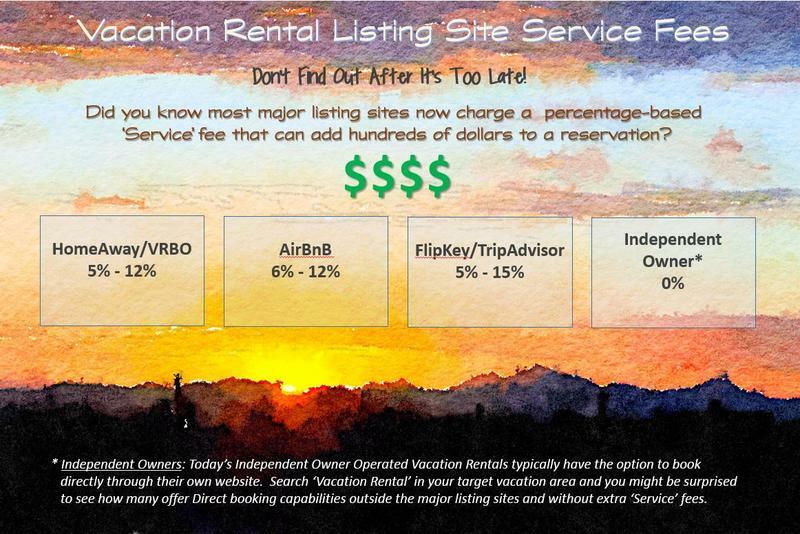 Vacation Rental Listing Sites – It’s Raining Money!! ” could have been an equally fitting title for this blog post. 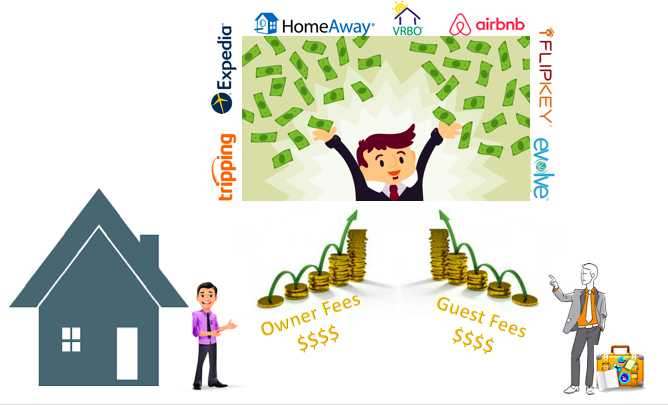 The rise of the sharing economy and mainstreaming of vacation home rentals has drawn big On-line Travel Agencies (OTAs) like Expedia, Booking.com, TripAdvisor, and others, into a marketplace that used to be comprised primarily of individual owners, small regional rental agencies, and medium sized advertising sites used mostly under annual subscription advertising models. These new players, with their relentless drive for corporate growth, are bringing significant change to the Vacation Rental (VR) market for both owners and travelers. They primarily focus on executing transactions for millions of hotel nights per year, not to mention airline flights, rental cars, excursions, etc... Revenue comes from fees attached to each transaction rather than fixed annual subscriptions as is typical in the VR marketplace. Unfortunately, OTAs like Expedia (owner of numerous VR listing sites including HomeAway, VRBO, VacationRentals.com, …) are bringing their transaction-oriented revenue approach to the VR industry. Hopefully in the long run, the resulting revenue growth will lead to reinvestment in infrastructure and broader marketing that will help grow the overall vacation rental market, which would be good for everyone. Unfortunately, their initial ‘bull in a china closet’ style seems to be doing the opposite for most owners - driving costs up and traveler booking inquiries down. The goal here isn’t to bad mouth OTAs or big business. As at least one primary goal, corporations exist to make money after all. The point is to highlight an alternative for travelers who value high quality travel experiences free of excessive, unnecessary costs. Many changes have been forced onto vacation rental owners under the push to mimic the OTA marketplace with lightning fast instant bookings, at-will cancellations, and new hurdles preventing guest/traveler interactions pre-booking. However, the biggest change travelers will care about is the OTA reliance on transaction fees now being applied by all of the major VR listing sites. Rather than a reasonable flat handling fee commensurate with the service being provided, the fees are based on a percentage of the overall rental cost, ranging from 5% all the way up to 15% of the total booking amount. That is a huge windfall to OTAs since it typically comes on top of listing subscription fees still being paid by owners, hence the meaning behind the earlier comment, ”it’s raining money”. Life is good at the OTAs. Just ask the CEO of Expedia who was the highest paid CEO in the country in 2016. What's a Savvy Traveler to Do? Fortunately for travelers there is a viable alternative to just blindly accepting the rising costs of using VR listing sites. Direct Booking! Like many other owners troubled by these changes, we have developed our own independent website – TucsonVillaRental.com. For now, the website augments our continuing use of VR listing site advertising. We will probably always have some reliance on listing sites to help fill-in gaps between our wonderful repeat guests, but hopefully we can reduce this necessity over time by focusing on enabling great guest experiences, leveraging social media, and consistently improving our search engine placement. TucsonVillaRental.com has been implemented with full ecommerce capabilities allowing us to streamline the reservation booking and payment processes – making it as quick and secure as the big VR listing sites. We don’t impose booking or ‘service’ fees, so travelers can be assured that the best value available will always be through a direct booking via our independent website. When planning your next vacation, consider searching for an independent VR owner-operator for more personalized service without added booking fees. 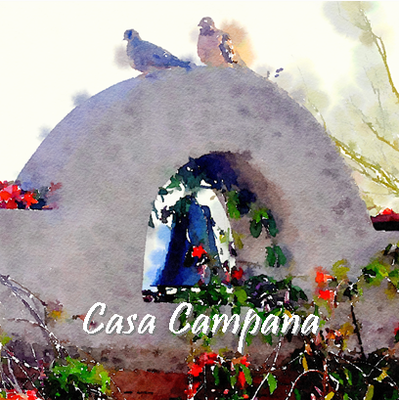 If you will be visiting the beautiful Sonoran Desert, we hope you will consider Casa Campana. We would love to hear from you - directly!